What’s The Guggenheim Doing in the East Village? In exactly an hour, at 6:15 p.m., The BMW Guggenheim Lab will kick off its film programming with a screening of Blank City. The Local talked with Paul Dallas, the project’s film curator, to see what’s in store for the neighborhood. How does Blank City reflect the history of the neighborhood? The film is really a document of the “No Wave” and “Cinema of Transgression” arts scene that happened in the East Village and Lower East Side in the late 1970s and early 1980s. It was the time when people were squatting in buildings, before the real-estate boom of the eighties, and the moment when artists could live in close proximity and foster this anti-establishment sort of art scene. It shows what was happening in music and art at the time through rich moments that have had an effect on artists and filmmakers since. Why did the Guggenheim choose the East Village to house its mobile lab? Manhattan has moved from an art production center to an art market. To be an artist in New York in 2011 is very different than in 1981. We chose the East Village for a number of reasons; it was to expand the reach of the Guggenheim into a neighborhood that has a history of experimentation and creative forces. 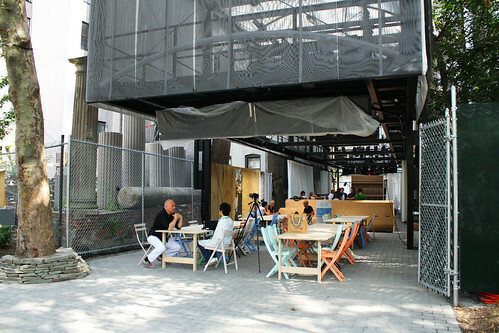 The first month of the lab is an investigation into issues of gentrification. A lot of artists have left the East Village; the area has changed radically. We want to contextualize what we’re doing as a kind of urban experiment that has a particular history in a place that is now something very different but also still connected to its history. How does the lab plan to involve the community? The whole reason for the lab is to have this discourse with the public and get people to come who might not go all the way up to the Guggenheim Museum in Midtown. We wanted to make this as street level and democratic as possible. We want to find out how artists can take the economic constraints of today and use them for raw material to inspire their art, and how they can find space for their craft. Artists at every time in history have been up against economic forces, not to mention having to fight to find a decent space. The lab is kind of saying that it’s still possible, that you can make a space happen. We’re in a vacant lot. It doesn’t take a lot to create something—it takes energy of people willing to do it. Are there East Village artists involved with the project? Yes, there are some very interesting artists such as Justin Bond. How have residents reacted to the lab? Mostly with curiosity; it’s just such an odd thing to happen. I think this week will really be the test.